An easy vegan dip recipe seasoned with Moroccan spices that is as beautiful as it is delicious. Pairs perfectly with fresh pita bread or pita chips. One of the things that it seems like it’s hard to do when you’re on Weight Watchers (or any diet) is to go to parties. There is usually a lot of food but much of it is laden with fat and calories that you don’t need and won’t eat. With the holidays just around the corner, it’s the perfect time to get your repertoire of recipes in shape to bring the tastiest and healthiest treats to parties. And trust me, one of those recipes you’re going to want to make is this delicious Moroccan Carrot Dip. Moroccan dishes are usually flavored with a wide variety of rich and zesty spices. Because they use so many spices, the spices don’t get old in their cupboards, like they often do in ours. Keep that in mind when you think your food is getting a little bland. Spices do tend to get old and bitter, or just become less potent. Keep your spices fresh and you’ll end up with more delicious food – especially when it comes to this Moroccan Carrot Dip. There are several spices that are commonly found in Moroccan cooking. The four basic spices are salt, pepper, ginger and turmeric. There are several other spices that are frequently used – saffron, paprika, cumin, cinnamon and white pepper. The spices are essential to give this dip a deep and rich flavor that is a little spicy but not too hot. The spices give this dip an exotic flavor, but the base of the dip is the sweet carrot. You’re probably used to the orange carrots. You probably use them in cooking on a regular basis. For me, I usually keep a couple of pounds of carrots in the fridge crisper. They last for quite a while, and I love to have them on hand for recipes as well as for snacking. I like to roast them, or steam them and season them with spices to serve as a veggie with our meals. But carrots aren’t just orange, they come in a variety of colors -purple, red, yellow and white. It might seem a little weird to have purple or white carrots, but they are just as delicious and a great way to add fun color to your meal. The rich colors of carrots are also where they hid many of their nutritional benefits. The classic orange carrot contains an antioxidant called beta-carotene. In fact, beta-carotene is where the carrot gets it’s orange color. This antioxidant is absorbed and converted into vitamin A during digestion. Vitamin A is a fat soluble (stored in fat) vitamin that helps with the immune system, vision and reproduction. In addition to vitamin A, carrots are also a great source of fiber, vitamin K, potassium, folate, vitamin E and zinc. Fresh, raw carrots are a great way to get vitamins, help protect your body from cancer, improve your vision, protect your liver and even help with your cholesterol levels! This vegan dip is bold and exotic. It’s the perfect way to wow your guests with a delicious and healthy dip for parties. If you’re lucky enough to have any leftovers, it’s perfect to add some flavor to wraps or sandwiches. 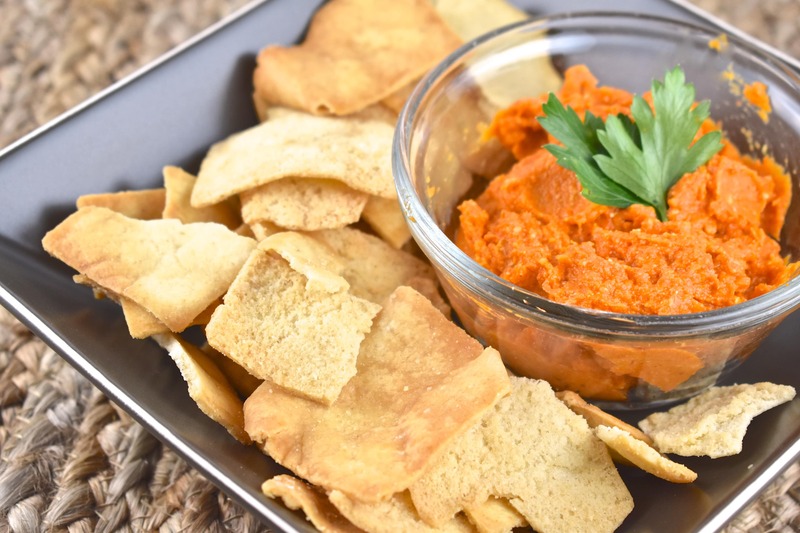 The sweet carrots, tangy lemon juice and vinegar and the striking flavors of the spices all create a perfect dip that is rich, creamy, delicious and healthy. An easy vegan dip recipe seasoned with Moroccan spices that is was beautiful as it is delicious. Pairs perfectly with fresh pita bread or pita chips. Heat 1 tbsp oil in a saucepan over medium high heat. Add carrots and some salt, and cook until carrots soften, about 5-6 minutes. Stir in the garlic and all the spices, and cook for about 1 minutes. Add the water and bring to a low simmer. Reduce heat to low, cover, and cook, stirring occasionally, until carrots turn tender, about 15 minutes. about 15 minutes. Transfer carrots to a bowl, and mash with a fork. Stir in remaining olive oil, lemon juice, and the vinegar. Cover and refrigerate for about 30 minutes. Season with additional salt and pepper before serving. How are there 0 carbs and 0 fiber in a mainly carrot dish?